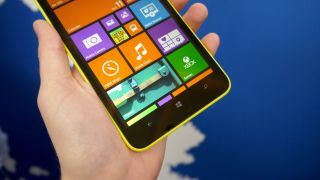 Nokia's inaugural Windows Phone 8.1 devices have been outed as "Goldfinger" and "Moneypenny." The two double-oh-seven inspired names were listed by serial product leaker @evleaks, who has a pretty spot-on track record. There isn't much to go on beyond the monikers, but it is believed that Goldfinger will be the new flagship of Nokia's Lumia line. As Nokia's new "golden boy," the device is expected to come with a new feature called "3D touch," which allows users to make gestures around the phone instead of just on the touchscreen. The phone will have hardware sensors to detect where the phones owner's hands are in a similar fashion to Air Gestures on Samsung Galaxy S4. The Verge has it on the authority of sources that Goldfinger owners will be able to interact with the device by making hand gestures above and to the side of the device. These gesture controls could include scrolling and flipping, letting Windows Phone 8.1 users navigate through menus without actually touching the screen. Currently the word on the street is that Microsoft is tiptoeing towards a Mobile World Congress 2014 unveiling of its latest mobile OS. Windows Phone 8.1 is expected to bring several enhancements, including a new notification center, better multi-tasking, and a Siri-like Cortana voice assistant. Nothing is confirmed, but it looks like we'll have at least two new handsets sporting the new features. iOS 7.0.4 is here to save you from dropped FaceTime calls.